The Griffon vulture (Gyps fulvus Linnaeus, 1758) stands among the biggest European birds of prey. It is a big vulture belonging to the order of the Accipitriformes and to the family of the Accipitridae. Like all birds belonging to this group, it lives eating carrions it assiduously looks for while staying very high in flight, in more or less numerous groups and that, controlling constantly each other, indicate with their movements the discovery of the carcasses. It is unbelievable how, after having sighted one of them, in an extremely short time all the birds present in a range of tens of km they converge on the prey suddenly arriving from all sides as if the information had been transmitted them via the air. It is a powerful bird with ample wings and not too developped tail but is kept always wide open when flying thus increasing the lift and the capacity of remaining suspended in the air. 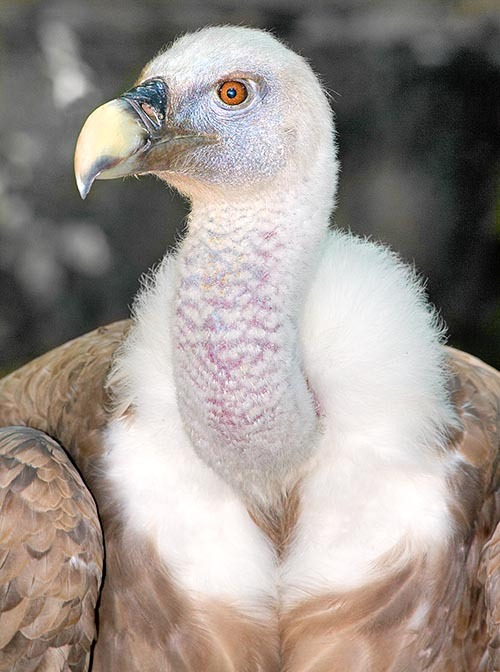 More than any other bird the vulture is a specialist in gliding and can fly for entire days without any beat of wings. It is a real flying cleaner and nothing escapes to this bird. This behaviour strictly connected with the presence of flocks, herds of cattle and big animals, has often obliged it to abandon the territory in function of the decrement of these types of breeding. Then a very strong human pressure has added, often due to the ignorance and to the lack of knowledge of the behaviour of this animal. 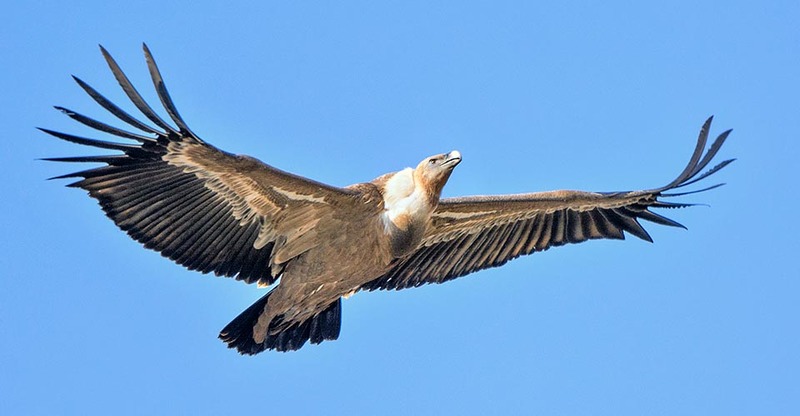 Previously considered as an attacker of live animals and then indirectly victim of poisoned baits intended for other and real threats (wolves, foxes and feral dogs) whose carcasses became later on usual food for this cleaner, the vulture has been practically decimated and extirpated from vast Mediterranean areas. Sardinia and Sicily, once areas densely populated by this bird, have been almost totally abandoned. Nowadays only in Sardinia about 30 pairs do exist, only bulwark of this very old Italian stock. Reintroductions in the Sicilian Parks are however underway. 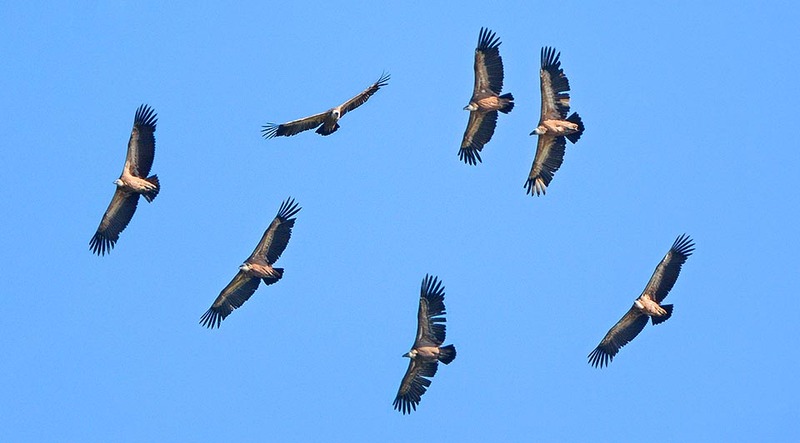 Same treatment suffered in Africa by other species of vulture and in some cases also by our griffon vulture seen that some specimens, luckily sporadic, often and willingly engage in strays taking them there. The ethmology of the scientific name comes from the Greek “gups” = vulture whilst from the Latin “fulvus” comes the fawn or brown colour of its livery. Several are the vulgar names given to this big bird. 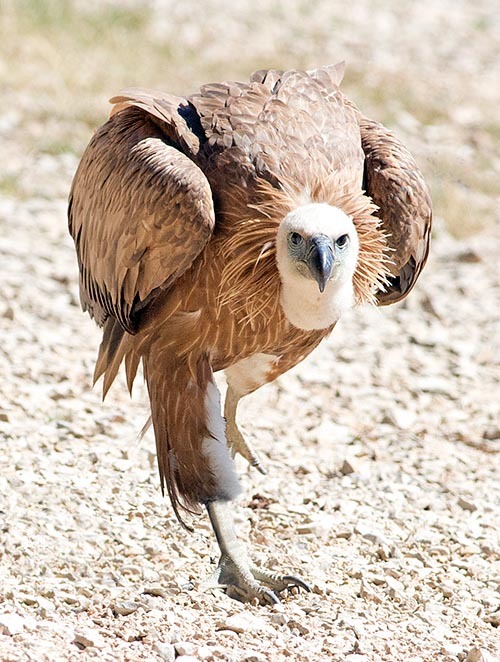 In English, Eurasian griffon vulture; in French, Vautour fauve; in Spanish, Buitre leonado; in German, Gansegeier and in Portuguese, Abutre-fouveiro. 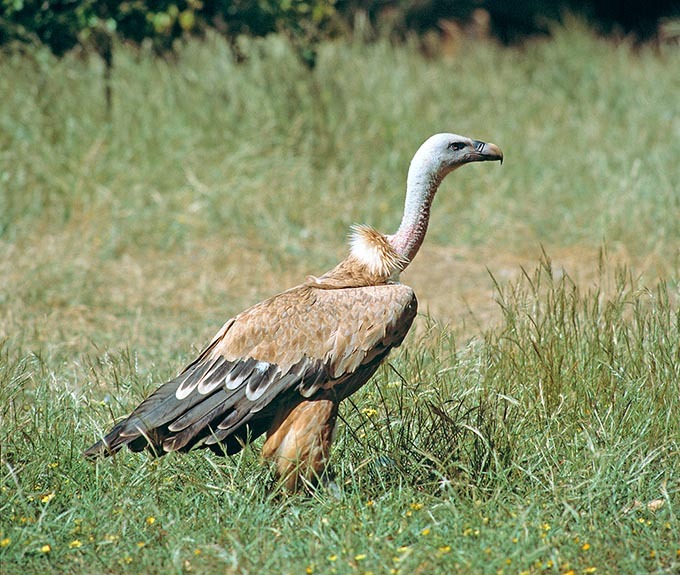 The griffon vulture has Eurasian diffusion with some isolated colonies on the African territory. On this continent it is met only in Morocco and in Algeria, in Abyssinia and in northern Ethiopia. The European diffusion includes Spain, Sardinia and the Balkan Peninsula. During the last decades they have created some consistant and isolated colonies in France (Gorges of Verdon and in the Jura), in Friuli (Cornino) and in Austria, due to the creation of charnels for the feeding and the concentration of wandering specimens, operation not only successful but that attracts also specimens living elsewhere and that reach the site only for feeding seen the abundance of carrions. This to mean the facility that these birds have in moving even to hundreds of km far away without any difficulty. It also occupies vast Asian areas of Anatolia up to Himalaya and northwards in Kazakhistan. Is present also in Lebanon and Israel and in the Arabian Peninsula where it has discreet colonies in Yemen. The griffon vulture is a sedentary bird ond only occasionally performs some movements, even at long range, for reasons still unknown. It’s a bird living a sure growth in the global population, also due to a better awareness and to a lesser and controlled hunting pressure that often saw this bird object to withdrawals by poachers and embalmers. 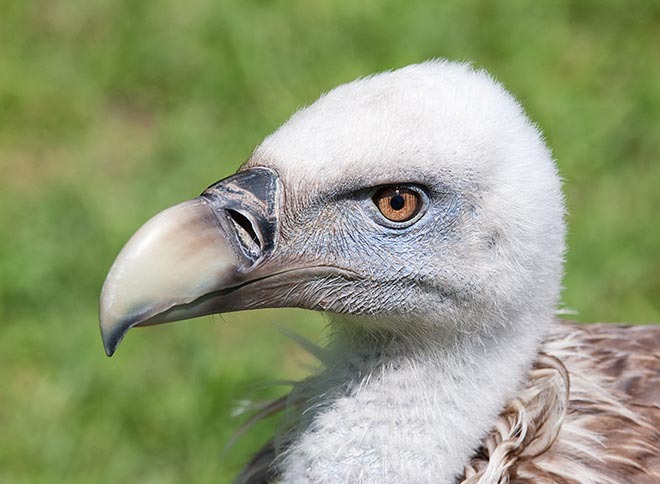 Besides our griffon vulture, the genus Gyps includes six more species, the Gyps coprotheres, Gyps rueppellii, Gyps himalayensis, Gyps indicus, Gyps bengalensis and the Gyps africanus, living in Asia and in Africa. 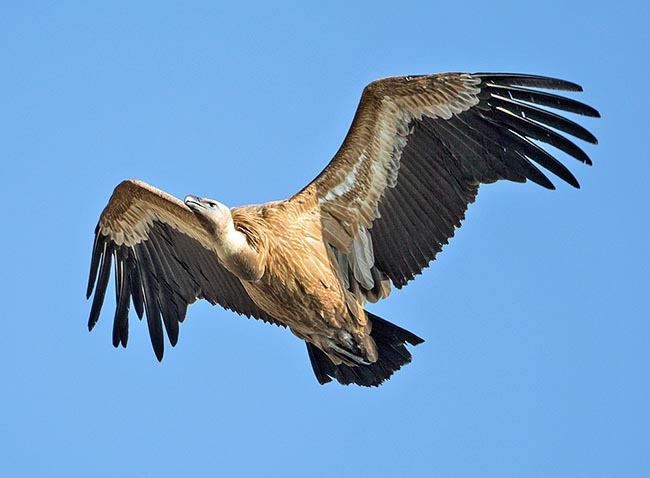 The griffon vulture lives in dry and without trees zones rightly for having a capillary vision of the territory. It loves flying over the plains, the rocky slopes of the mountains, the stony and rugged grounds, semi-desert zones, places frequented by grazing animals or rich of big game. It usually lives in warm and sunny zones but bears with facility the Mediterranean winter temperatures remaining in its territory even during abundant snowfalls, provided the presence of availability of food. It systematically avoids swamps, lake areas and wetlands. Conversely, it needs inaccessible rocky walls for spending the night and for the nidification. These impervious walls are also essential for intercepting the thermals and the winds passing there vertically during the warm hours. It lives up to 2500 m of altitude. The griffon vulture is a strong bird and cannot go unnoticed seen its size. It easily reaches the length of one metre and the wingspan of 280 cm that, albeit resized to our sight considering the incredible altitudes they reach, is always a considerably sized measure. The weight usually exceeds the 8 kg especially if it gets the opportunity of gobbling big quantities of meat and in such case becomes so much heavy to prefer keeping on the ground during the pre-digestion and taking the flight only if necessary. It can at times reach the 12 kg of weight. So great is the greed that when it finds availability of food, so great is the capacity in bearing the hunger when it does not find it, remaining even one week without food. The beak is strong and powerful, able to carve and cut the hardest skin and at times wizened by the sun and the time, of the available carrions. In any case, it loves the soft parts of the carrions. The neck is bare and covered by a light white down becoming totally red of blood when it soaks the neck into the entrails of the animal. For this reason, the vulture bears a nauseating smell that attracts thousands of flies and insects drawn by these remains. Their digestive apparatus is reduced to just three metres but is endowed of so powerful acids that it is able to destroy any bacterial form present in the food. The adults have an elegant small woolly white ruff at the base of the neck that creates a neat separation with the brown chest. In the young this is replaced by short cream coloured feathers. The head is fairly small almost totally occupied by this immense hooked grey beak and strong turkey-like feet with big claws but absolutely unsuitable for the predation. The juveniles are darker than the adults and have a more pleasant colouration, more contrasted in the colours. The wing coverts are totally grey/pale brown with the body diffusely of an elegant hazel cream colour. In the lower part of the wings we clearly note the remiges and the black tail and the hazel wing coverts. Determining points for the classification when flying and the distinction between this species and its other congeners. It has a fairly long life expectancy as it often exceeds the 40 years when in captivity. The griffon vulture reaches the maturity after the 5 years but at times even after the 7; species strictly monogamous, the couple remains united all the life long. It nests on impervious and inaccessible walls usually overhanging or close to its feeding areas. The nest is placed in vast recesses often sheltered from the top and at times also in good depth into the rock. It already spawns from the month of January and performs a hatching lasting about 60 days from the deposition of the only egg. The chick at the beginning is always cared with love by the mother to avoid the predation by the birds of prey especially the common ravens and till when it has reached a size that protects it from such attacks. Later on, the parents engage both in hunting leaving the young alone ; it will remain in the nest for a period of even 4 months. It usually nidifies in colonies of a ten of couples even if have been reported aggregations exceeding the hundred units. The griffon vulture is considered as a highly protected species and is included in the attachment II of the Bern Convention.